This is a complete and original NEMA cipher machine in excellent working condition. The Swiss NEMA is an electro-mechanical wheel-based cipher machine that was developed by Zellweger AG in Uster Switzerland during World War II as a replacement for the German Enigma model K that was being used by the Swiss Army. The machine is also known as T-D, which stands for Tasten-Drücker Maschine (key-press machine). This NEMA machine carries the serial number TD-311. It was used by the Swiss military to train cipher machine operators. This machine shows some minor signs of use as a training machine, but is in perfect like-new condition. The machine is in working condition and is accompanied by an original operators manual as well as two original keys to the metal NEMA carrying case. The original external power cord and external lamp panel also accompany the machine. 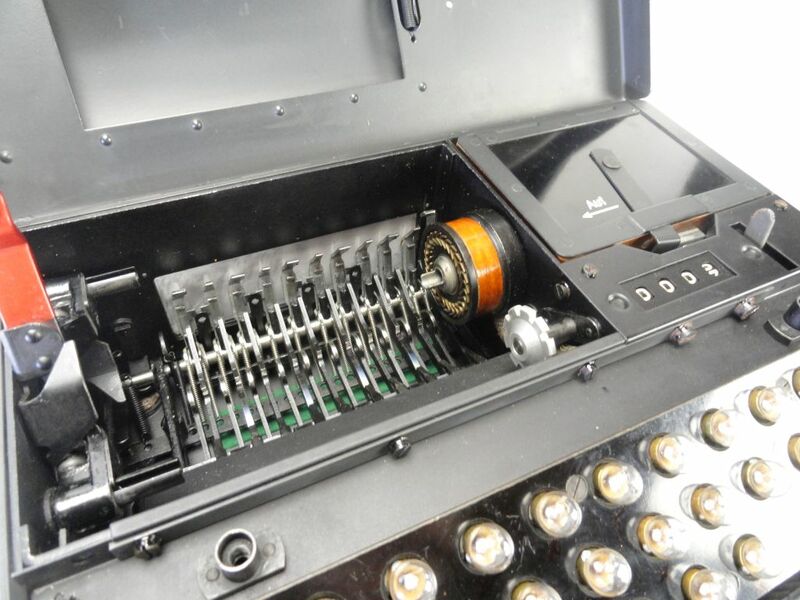 During WWII, the Swiss Army used a modified version of the German-made commercial Enigma model K machine. After the Swiss discovered that their Enigma K traffic was being read by both the Allied forces and the Germans, they started the development of their own improved machine, which they called NEMA. The term NEMA is derived from “NEw MAchine” or “NEue MAschine”. The NEMA cipher machine was developed between 1941 and 1943 and the first prototype was ready in early 1944. After a few modifications and improvements, the machine was finally approved in March 1945. Production started in 1946, with the first machines entering service in 1947. The NEMA was used by the Swiss Army in the years following WW II, and by the Diplomatic Service. This excellent example of a fully working NEMA machine is located in the United States and available for sale.